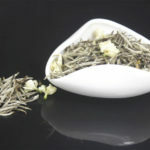 We offer three grades of jasmine silver needle tea, Supreme jasmine silver needle, Premium Jasmine Silver Needle and Jasmine Silver Needle. This is the intermediate one. It differs from the Supreme jasmine silver needle in that the scenting time of it is one time less, seven times. (The former is eight times scenting). Though either seven times or eight times are considered as very intensive scenting jasmine. Around 1% of the tea quantity of magnolia flowers are also blended into the jasmine flowers to add the sweet aroma, besides jasmine fragrance. The tea base is the single bud silver needle tea harvested in April in Fujian. And then it was sent to Guangxi for jasmine scenting in the best of its season, in the end of Summer. 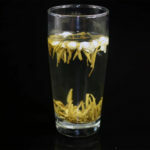 The tea body of the jasmine silver needle is even and cute, covered by white hairs. Hoe does it taste: It gives off very pleasant and lingering jasmine fragrance, with a hint of sweetness (from magnolia flower)! It is in very few cases by most of the customers experience that they can feel such charming aroma. The taste is very rich and mellow smooth. The Health Benefits of Jasmine Silver Needle: It can refresh the mind, relax nerve and anti-depressant, offer anti-oxidants, anti-tumor, regulate immune system,improve cardiovascular health, whiten skin and keep body fit.